I am an avid golfer and I live in the northeast part of the country. New Jersey to be exact. This part of the country can be tough for an avid golfer such as myself. Sometimes the winters can be pretty rough here, thus shortening our golf season dramatically. If you live farther north on the east coast or in the north central states then your golf season could be even shorter unlike states like Florida, Arizona or other parts west where you can play golf pretty much year round. I thought I would take some time here to offer you some alternatives to help you keep yourself in great golf shape year round in the comfort of your own home, basement or heated garage. 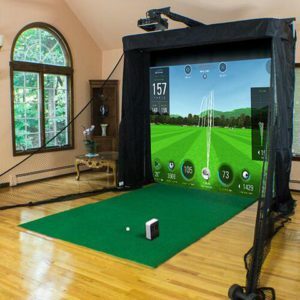 Today, thanks to modern technology you can accomplish this with new high tech home indoor golf simulators, golf practice net packages and golf indoor putting greens. Dollar for dollar the SkyTrak home indoor golf simulator is probably one of the best golf simulators on the market today. The platinum package starts out with the SkyTrak launch monitor, the net return simulator series and the projector mount system. Your SkyTrak simulator is also completely self-contained, meaning there is not need for drilling any holes making the setup of your simulator a breeze. Also, included in this package is a rugged and durable golf hitting mat that provides balance and forgiveness and realism. I purchased my SkyTrak platinum golf simulator a little over a year ago and I am thrilled with it. The simulator is very durable and easy to set up. The simulated path seems to be very accurate with every one of my clubs. I am very pleased with my purchase of my SkyTrak golf simulator. It was quite easy to set up and any questions I did have been answered promptly by their support team. I would highly recommend this simulator to any avid golfer. If you are interested in a golf simulator but are on somewhat of a budget, you may want to consider the OptiShot 2 Golf in a Box. Although the golf in a box may not have all the features of some upper tier simulators, they have come up with a relatively affordable compromise. The Golf in a Box comes with the OptiShot simulators, a pop up net and a mat that fits perfectly with the Golf in a Box system. If you want to spend a few extras dollars you may want to opt for the OptiShot 2 home package. 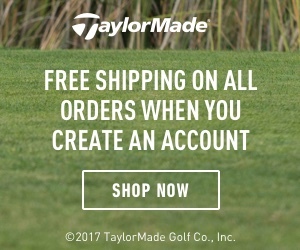 This package comes with the OptiShot 2 simulators, an extra heavy-duty net return system with side nets and a pro turf mat all for a few extra bucks. 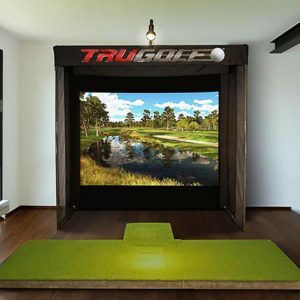 The SkyTrak home course golf simulator is perfect for anyone that has some extra room in their garage. The home course golf simulator comes with a ceiling mount kit so you can mount your golf simulator screen to the ceiling of your garage. When you are not using your home course golf simulator you can simply retract it with just a push of a button. Just move your golf hitting mat out of the way and you can park your car back in your garage. Being able to store your golf simulator when not in use makes the SkyTrak home course golf simulator perfect for garages. 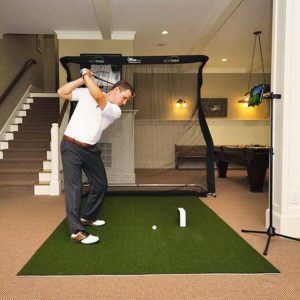 The SkyTrak golf simulator with the net return pro or pro series net is very easy to set up and its lightweight design is perfect for creating your outdoor golf simulator setup. 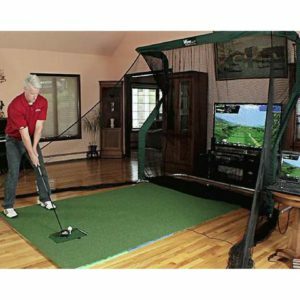 It is highly recommended that you pair the SkyTrak simulator with the net return net and mat package. The net return net is the most durable golf net available with a 250,000 shot guarantee. 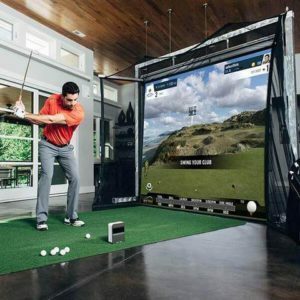 Another great thing about the Portable outdoor golf simulator is the ease in which you can put it up or take it down. With a total weight of just 28 pounds you can easily move the entire set up inside in bad weather or outside in nice weather. If you want to move on to a commercial grade golf simulator there are several top recommended simulators. For high end pro shops, golf simulator bars and elite country clubs the TruGolf Vista series 8 would be highly recommended. The vista series 8 comes with E6 golf software, TruTrak swing analysis, high definition image quality It’s lightweight design makes it a great high end commercial simulator. For smaller pro shops, bars, restaurants and college teams looking for a great value commercial golf simulator you really cannot go wrong with the SkyTrak Platinum. I hope you have enjoyed this article on some different golf simulators that you can enjoy from your home. I also hope that you have learn something about these different golf simulators and can find the right one for you.